Sounds like a follow up book is needed to include some more info, like he mentions at the end of the interview. 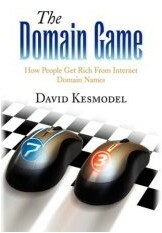 I’ve read the book and it is a very good read about the early days of domaining. Best approach would probably be an expanded, 2nd edition containing the additional information David would have liked to include. Thanks for the nice interview and book, guys. David is a great guy and a great writer. I am glad I bought the book. He explains so well the early days of the internet and how many made their futures on domain names. On note: Dave mentions how Scott Day was beating everyone to the drops in 1997 when everyone else were running scripts to catch them. Scott did not impart how he did it but I will. There was a seven day cache that we were filling in hopes of when the names came off “On Hold” we would be waiting. We were and did catch some of the most prized generic names available. Few knew. Great interview, I’ve always bee curious about what tactics writers and journalists use in order to get their subjects to open up and speak about their stories. Thanks. Unfortunately I don’t think we’ll see a follow up book from David. I doubt this was a profitable venture for him, especially after the publisher dropped the book. However, we can do what ever we can to get the word out about the book and sell more copies…you never know.